A U.S. Air Force F-35A fighter pilot flies over the Atlantic Ocean for the aircraft’s first transatlantic flight June 30, 2016. 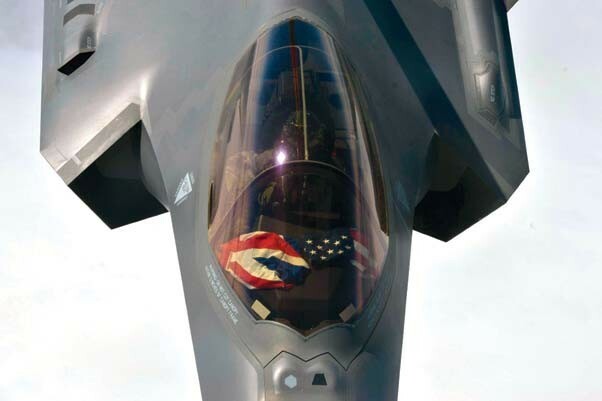 The F-35A is a part of the Air Combat Command Air Force Heritage Flight Team, which flew to Fairford, England, for the Royal International Air Tattoo. WASHINGTON, D.C. — U.S. Air Force Gen. Hawk Carlisle, Air Combat Command commander, recently discussed the importance of air superiority and the need to assure it by modernizing the Combat Air Force during a hearing of the House Armed Services Committee Tactical Air and Land Forces Subcommittee in Washington, D.C. This is the second of two hearings where ACC leaders have testified on the importance of air superiority to the defense of the nation. Carlisle’s testimony followed a similar hearing in June with Maj. Gen. Jerry Harris, ACC vice commander, at the National Museum of the Air Force. The purpose of the hearing was to discuss America’s future air dominance and the key role of fifth generation fighter aircraft like the F-22 Raptor and F-35 Lightning II. Currently, the U.S. Air Force conducts the air superiority mission with aircraft consisting of the F-15C, F-15E, F-16, F-22 and F-35. He stressed that while ACC continues to design and advocate strategies to define requirements, increase acquisition agility, and reduce procurement timelines and life cycle costs, these efforts can only go so far without the talented men and women who carry out the mission. He went on to explain that while our air superiority capability remains at the highest level, our near-peer adversaries are modernizing their capabilities to threaten our enabling technologies and systems such as the electromagnetic spectrum, space and cyberspace. 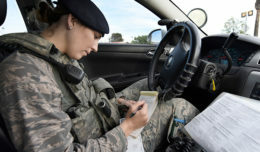 Carlisle stated that the Air Force is rising to these challenges through a strategy that deliberately capitalizes on the service’s strengths while exploiting adversary weaknesses, specifically in terms of achieving a “decision advantage”. He explained that the F-35 was a prime example of a weapon system that is able to process large and multiple sources of data, analyze and then display it to the warfighter to create an advantage over the adversary. Carlisle also noted the F-35 acquisition schedule and projected service life of the remainder of the fighter fleet continue to drive a requirement for 1,763 F-35As in order to preserve sufficient air capability and capacity for the military. Currently, 48 F-35s are set to be produced annually, but in order to address shortfalls in the F-22 procurement, the desired production rate is 60. According to Carlisle, continued investment in America’s air superiority is critical as adversaries will continue to test the might of the nation. Upon concluding his testimony, Carlisle thanked the committee for their service to the country, its Armed Forces, and for their support in assuring America’s continued air superiority capability.